Life. Art. For me, the line in between frequently gets blurry. Very blurry. A Top Pick from RT Magazine and with a Starred Review from Booklist! Don't miss out on the latest romantic comedy in the Bluff Point trilogy! Available TODAY! When I wrote the book, EVERY DOG HAS HIS DAY, I thought it would be fun to include a foster kitten named Chaos. He was a spunky little critter that enriched the story and the lives of my characters. Fast forward a couple of months and my family and I found ourselves rescuing a two week old kitten, who is now named King George, and is a solid (and spunky) member of our pack. Did writing about Chaos bring George into our life? Hmm. Another plot point in today's release is that my characters are stuck in a blizzard in Maine for three days. Next door neighbors with kids and pets, surviving a brutally cold winter -- great set up for a romance, right? Yeah, sure, and now I'm visiting New England and it looks like they're about to break the record for coldest number of days in a row since 1917 - one hundred years, people! I'm not saying my book brought on the cold snap, but I'm not not saying it either. So, if there is a life-art connection happening, I'm thinking in my next book my characters need to find a cupboard full of fresh baked pies or a trunk full of gold, you know, just to see if art really is imitating life. What about you, Reds? Have you ever written something and then had it happen to you? Coincidence or...? The blizzard caused power outage continued through three board games, lunch, an arts and crafts project that was supposed to be making snowflakes out of printer paper but turned into an epic fail when Zachary Caine unfolded his and it looked like six knobby penises. “Oh, wow, I didn’t see that happening,” he said. Jessie Connolly about choked on her own spit from trying not to laugh as Zach tried to hide his pervy snowflake from her girls. He should have known better by now. When he hid it behind his back, they attacked. Five-year-old Maddie wrestled it from his hands while seven-year-old Gracie distracted him by saying she heard someone on the front porch. When Maddie unfolded it, she frowned. “No—“ Zach tried to cut her off to no success. “Huh?” He raised one eyebrow at her. Jessie turned away. The urge to laugh was becoming too much and she had to fake a coughing fit to try and contain it. Parrots! Bless her innocent little girls’ hearts. “Are you all right, Momma?” Gracie asked. “Fine, I’m fine,” Jessie answered. Her voice was strained and she was still facing away from them, because she knew if she looked at Zach or his snowflake, she was going to lose it completely. The laugh when it came out of Jessie was something between and guffaw and a wheeze. As she looked at Zach’s phallic snowflake, she doubled-up with laughter. The more she tried to contain it, the worse the giggle fit became. Jessie pressed her lips together and nodded, trying her best. A snort erupted and tears sprang from her eyes. Jessie gave Zach a warning look that was likely ruined by the smile that still curved her lips. Jessie watched as he taped his snowflake along with the others they had made right in the center of the kitchen window. “It would be hard to find a better place for it,” Jessie said. This time it was Zach who hooted with laughter. He didn’t even try to contain it. His teasing gaze held hers and Jessie felt her face get hot. Both of her daughters beamed up at him as he began to fold his next piece of paper, and Jessie felt something in her chest shift. Happy book birthday, Jenn. Thanks for the excerpt . . . now I'm really looking forward to reading the rest of the book. Coincidence or not, I love the real life meets writing stories. Thank you, Joan! I love the real life-art stories, too. Oh, congratulations on your new release! I love the Bluff Point books, and this one sounds like lots of fun. I also wonder how I missed the story of King George, and what must have been epic round-the-clock feeding sessions those first few weeks. I have had enough art-imitates life moments, when writing fiction, that it has given me pause. For instance, I drove perfectly sensible SUVs until I wrote about a woman with a hot, classic Mustang, and now I'm on Pony Car #2. These days, though, I'm mostly writing about dead Russian composers, and so far (fortunately) none of those have shown up. Thank you, Gigi! Yes, the round the clock feeding was grueling! Oh, you smart woman, writing about a Mustang! Brilliant! Happy release day! Nothing to add about life imitating art, but it couldn't hurt to write about inheriting a fortune, could it? Exactly, Edith! I have to rethink a few of my plots - LOL! Love it Jenn, and can't wait to read my copy, which should arrive today! Gigi, very glad your deceased Russians are staying on the page:). Thanks, Lucy/Roberta! Release day is always so exciting! Happy book birthday! Answering your question, what I have had several times is writing an incident, then having something show up later in the news that is very similar.It is quite odd. Not really spooky - I don't even believe in spooky - but odd. Triss, it's the serendipity that gets me. As if you were looking for something you didn't know you were looking for and *bang* there it is. Congrats on the book, Jen! Love Chaos and King George! Those are quite the coincidences, and I agree with Edith. Couldn't hurt to write about someone coming into a fortune. But please don't write about any more bad weather for New England -- we're doing quite well on our own! Oh, yes, and I love the Mary Poppins review! Thank you, MaryC! I'm in MA right now and I am boggled by the cold - boggled. I promise to write a nice summer book next! Congratulations, Jenn! Chaos is a fabulous name. Seeing it reminded me of the cone of silence, altho I realize that in that case it was spelled with a K.
Gigi, are you sure you wouldn't want a new piece by Tchaikovsky or Kalinnikov? Of course, there's no knowing what else a dead Russian composer would bring into your home. Thank you, Jim! Uh oh, I see a book involving zombie Russian composers! Yikes! But, if they're dead, wouldn't they be de-composing? Happy book birthday, Jenn! I'm sharing with my sisters, who will love this! Happy book birthday! I love the stories and pictures of King George. And yes, couldn't hurt to write about a fortune and see what happens. Thank you, Mary! Or pie, don't forget the pie! Jenn, you write funny. And yes, that's a compliment. I can't think of any coincidences from my writing, but I'm with Edith about giving it a try. Couldn't hurt, right? I'm mostly indifferent to cats/dogs/etc. on Facebook unless I'm personally acquainted with them, but I've so enjoyed your King George photos and comments. He's a charmer. Thank you, Karen. George is delightful handfull! The boys and I are heading home tomorrow and while I've really missed the Hub and all of my critters, I am anxious to see the baby - George. I'll be sure to post pics when I'm back in AZ! 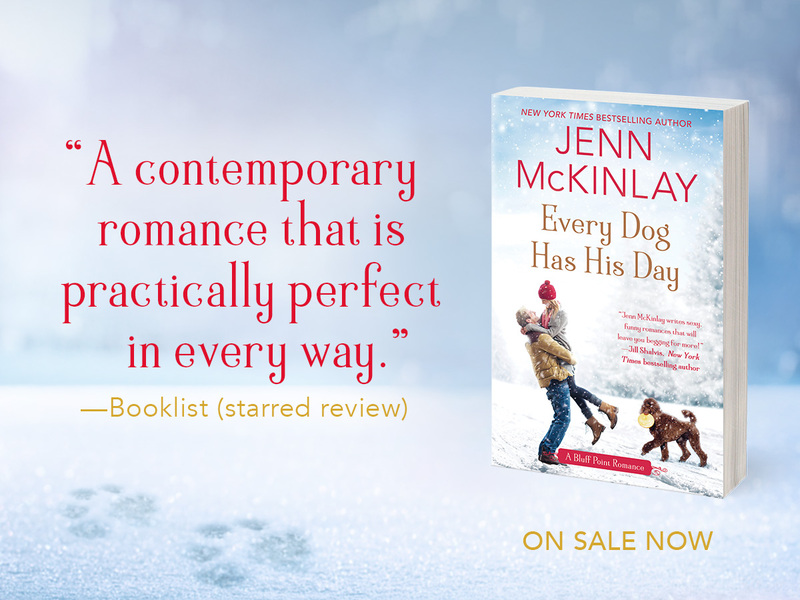 Congrats on EVERY DOG HAS ITS DAY, Jenn! And yes, you need to write a book where Maine has an unusually mild and temperate winter. As soon as possible, please! Noted, Julia! 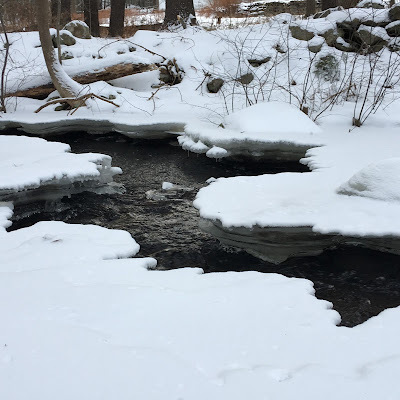 Lord a mercy, I can not believe how cold it is (we're in MA). The boys and I bought soap bubbles to see how long it would take them to freeze - at 5 degrees this morning it took ten seconds! Gah! This book is so much fun! Thanks for sharing, Jenn. Seems perfect for a cold winter when full immersion in a funny, heartfelt book goes perfectly with a cup of hot tea with honey. Parrots. Hmm. And I truly hope you don't have a power outage in your near future. It's 2 degrees right now in Boston. Tomorrow warming into the 20s. Then snow. Feh. Some of what I write is inspired by things that actually happened... I'm just not saying what. Very wise, Hallie, to keep the inspiration on the down low. I'm not sure the cold snap is going to help me sell a book set in a blizzard - Oy! - timing, as they say, is everything! Happy pub day, Jenn! You're prolific, and I'm in awe of your ability to write so well, so fast! I haven't had much experience with life imitating art, but maybe that's a good thing; Fina lives more dangerously than I do! LOL, Ingrid! Yes, I like to visit Fina's world, too, but like you I'll pass on the danger! EVERY DOG HAS ITS DAY is waiting on my Kindle and will be my reward at the end of today. Now I just have to pack up all the Christmas decorations and get the tree out so I'll deserve the reward! Thank you, Christine! You're a better woman than I am. My decorations will wait for the weekend when I'm home - thankfully with the kitten we were decoration light this year. Thanks Jenn! I needed a good laugh to start off the day! I'm about to make another hospital run to check on Mom and see what's up. If there is no sleet on the highway. Bleah. Be safe, Pat D! Happy to get a laugh out of you. And I do hope your Mom is feeling better soon. Happy book birthday! What a grand way to start the new year. Congratulations! You are SO funny! Might I say: perfect in every way!! Hurray!! You may say, Hank, and you're loving for doing so! Congrats on the new release! And good luck with that cold snap. Yikes! Seriously! I am ill-prepared for this - three pairs of socks today - I shiz you not! Happy Release day, Jenn! I haven't had life imitate art like that but if I'm writing aChrustmas book in the middle of summer I'm always cold and want to turn on the house heating! Rhys - that's too funny! I can picture John finding you at work in a hat and scarf! LOL! Happy pub day, Jenn! 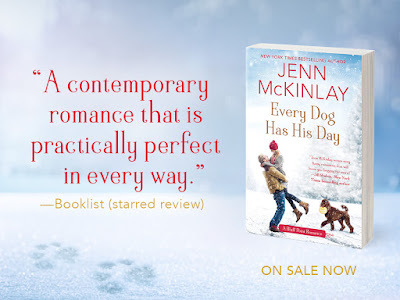 Can't wait to read EVERY DOG HAS HIS DAY, which is on its way to me! Debs - I love the way you think. LOL! Next book, I'm writing in a pony! JK! What a great post, Jenn! You had me laughing all the way through it. The excerpt from the book is so hilarious. I thought the setting, with the characters being snowed-in in Maine was the selling point for me, but after reading the witty banter from the excerpt, I see that was only the beginning. Happy Book Birthday, Jenn! Jenn, Congratulations on the book release. I only write for myself. However, still 40 years on, I still am fascinated by the coincidence of the film The China Syndrome with Jack Lemon and Jane Fonda, hitting the theaters the same week as the incident at Three Mile Island. I don't think America has built any nuclear reactors since then. Congrats, Jenn! Your book is the next one I will be reading, promise! Pretty sure it will be great! When I was traveling, after we went to Windsor Castle, they had a fire. York Cathedral, fire, and San Francisco, an earthquake. Bet everyone not in Central PA is glad that I don't travel anymore. But not too far from Three Mile Island, which may be closed down soon. Jenn, what a great post! I was reminded of a story that I wrote in the 6th grade about a Deaf woman winning Miss America then years later, a deaf woman (Heather Whitestone) won Miss America. There was another deaf woman who won Miss America too. Now that's a self-fulfilling prophecy! So great, Diana.